Welcome back to this week’s Six Degrees of Kool Books installment! If you’re not sure what that means, then take a trip over to my original post to find out what this fun blogging game is all about and how you can get involved! You can also go over to my “categories” on the sidebar there, click on “Six Degrees of Kool Books” and see all of my posts associated with this meme. Also, if you want to participate, but don’t blog on Tuesdays, or had an idea from an earlier post, feel free to just post whenever you want, and in whatever strand of the game you wish. For example, if you’d like to write about a character that DJ’s first post that discussed characters from THE HOBBIT sparked an idea for, but you feel you can’t because you missed that week… I’m here to tell you: GO for it! Thus, without further ado, on to today’s post. Last week, DJ posted about the book CITY OF EMBER and several of the characters therein. I have seen the movie, but, sadly, have not yet read the book. But that’s okay! Because the whole point of this game is to describe the characters effectively enough that even if you haven’t read the book, you can still think of another book with a character that reminds you of one of the characters described! Of course, this made me think of the character Sunny Baudelaire from A SERIES OF UNFORTUNATE EVENTS by Lemony Snicket. Now, I’m not sure if Poppy and Sunny are all that much alike, having never read City of Ember, and I don’t know if Poppy is as central a character, but Sunny is a marvelous character. And besides, how many books (besides children’s picture books) feature a toddler? There must be some similarities – so I did a little reading up on what others had to say about her character from the book. Both characters are precocious and extremely toddler-ish. Of course, in A Series of Unfortunate Events, the author does us the favor of translating Sunny’s baby-talk, making her seem a bit older than she is, and yet, somehow, she remains a somewhat believable toddler in the eyes of the audience. (Though many fairly unbelievable things/people/events surround them). Possibly this is because Sunny likes to bite things (not people though, unless they are villains). Both characters, in typical toddler fashion, are extremely adorable. And both can have a tendency to wander off when nobody is watching them, though it sounds like Sunny does this less than Poppy does. Like Poppy, Sunny also has a loving older sister (and brother) who watch after her and care for her after the death of their parents. Violet, the eldest of the three children, is the inventor in the family. She excels at coming up with useful contraptions, as well as building said contraptions out of whatever parts she has available. When Violet ties her hair up with a ribbon, her friends and family know she is in the middle of thinking up some marvelous solution to whatever problem they are facing. Unlike Poppy, Sunny also has an older brother named Klaus. Klaus is the middle child, and the reader, of the family. What Klaus loves more than anything is to curl up with a good book, and he enjoys most subjects indiscriminately. He also remembers everything he reads, and can call up information a little bit like Google. He is fiercely protective of both his sisters, though Violet is the more assertive one. In the books he always remains fairly optimistic about their future, in spite of all the horrible and ridiculous situations they find themselves in. Most of which are the direct fault of Count Olaf. Count Olaf is purported to be a distant relative of the Baudelaire family, and is their very first guardian after the children’s parents die in a fire that burns down their home. He is out to get the orphans’ fortune any way he can, and creates more and more elaborate schemes in his attempts to steal it from the children. The Baudelaires spend the entirety of the series running away from Count Olaf, who is so despicable it’s actually a bit hilarious (or perhaps that’s just something I find to be true because I love Jim Carrey’s portrayal of him in the movie version so very much). Finally, there is the banker who is in charge of the children’s estate. Mr. Poe, who is always woefully oblivious to the predicaments that the children end up in, always misreading the situation in the worst possible way, and far too busy with his own banking career to be very helpful to the three children who could use an adult on their side. Neither a villain nor a hero, Mr. Poe is tragically (in the worst sort of way) incompetent and unhelpful at every single bend in the road. There are several other characters, but most of them have small roles where they are relegated to a single volume or two and do not play a major role throughout the entire series the way that the other characters I mentioned in this post do. Either way, this is a delightful series of books. I read the first book first, then saw the movie, then saw the movie again a dozen times, then finally finished reading the series. I think this is one of those strange circumstances where I actually like the movie better than the books (though the books are very entertaining and written with a large amount of sarcasm by the author, which I enjoy rather immensely). However, be warned. This is a movie that requires TWO viewings. The first time you see it, you will most likely walk away thinking, “Well, that was……….. bizarre.” And sort of scratch your head and wonder what in the world people like about it. The second time you watch it, you will think it is the most hilarious thing you’ve ever seen. At least, that’s been my experience with everyone I’ve introduced to it. So, the sample size is small. Remember that you are more than welcome to participate in our Six Degrees of Kool Books meme, either by posting about a character that reminds you of one of the characters I discussed here, or in any other Six Degrees post by any other Six Degree Participant (in any given week)! I promise, it’s both fun, and a neat mental exercise. If you do decide to participate, please remember to link back to this blog or DJ’s blog, and also let us know you are participating by putting your name and blog post URL in the Mister Linky widget below! That was a fun movie! I haven’t read the books, though. I saw it at the cinema and liked it the first time – in fact, I haven’t seen it again. Does that make me weird? LOL, Apparently! Just kidding. Like I said, my sample size is small. The books are pretty fun, as well, though in classic easy-reader fashion, they do tend to reiterate who everyone is and what has happened so far in every book… after a while I started skimming through those bits. I know authors do it because books come out a year or two apart, but when the entire series is finally out and you are reading them in quick succession it gets a bit tedious to re-read information. Yes, it does sound like Sunny and Poppy share a lot in common. Three cheers for toddlers! Never a dull moment when they’re around, that’s for sure. This is another one I haven’t read. Nor have I seen the movie. The advertising for it looked reminiscent of Tim Burton so I stayed away. I did not realize that it was an actual series as well. I take it they are shorter books? Well, I’ll be putting on my thinking cap and trying to come up with a connection to Sunny for this series of quite fortunate posts! The movie is fantastic, and not at all Tim Burton-esque (though I can see why the advertising would have made you think that). It definitely is a more bizarre type of humor, and kind of dark… but the darkness is overshadowed by a lot of take-you-off-guard-laugh-out-loud moments. It is very snarky and witty, and you have to pay attention to everything… even the dedications, because they (as is the “author” – in quotations because “Lemony Snicket” is a fictional character himself) are all part of the story. It is a series of 13 books, and they are very short. I had those exact feelings over the movie. I love it now, but the first time it was so odd I didn’t think I’d ever watch it again. I love the books too. Snicket is one of my favouritest Authors. 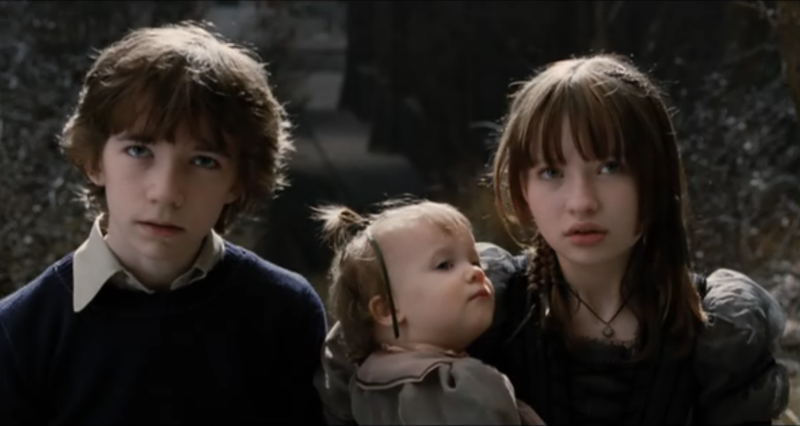 His new series is really good two, but I think I like the Unfortunate Events a bit better. Sunny was adorable in the movie. And lots of fun in the books. I’ve never read anything which made a toddler so enjoyable.